I just launched an instance of Magento 2 from the AWS Marketplace. I used SSH to go through the initialization process. After setting passwords and a domain, I am at an error window and cant proceed any further. See attched screenshot. It seems there is not support for the products you are selling AWS Marketplace. At least, this forum seems to be the only method of communication. So far, it has been one-way communication. No assistance. No response. Since it has been within the 90 period. I would like a refund of the annual subscription I paid for. My AWS Account number is: Account Id:187230593969 The transaction was on 2/6/2019. Hi Bryan, sorry I missed this while I was researching and posting my initial response (below). I have actually also just double checked my notes and realised that how we worked around it with the previous user who hit this, was to use the built-in Webshell to initialise the appliance. [Update: it turns out that Webshell is not required - via PuTTY is also an option - see my latest post below] I suspect that there is some work that may be required within the (initially broken) terminal to get to that point (and it appears my notes may not be as complete as I would like). Unfortunately, I don't recall the name of the user who had this issue previously, but I will search through our support portal to find the explicit steps required. Also, another easier way to workaround this issue would be to use our TurnKey Hub. That provides a web interface for this initial setup, thus completely avoiding the need to log in via PuTTY to run the initialisation; and thus the issue you are hitting. (FWIW the character rendering issue will still exist in PuTTY, but won't be fatal to get you started). I've sent you an email regarding your refund. I'm unable to grant your refund and am wondering if you accidentally made a typo when posting your AWS user ID? I've sent you an email about it. Please get in touch ASAP (ideally reply to the email - or send new mail to support@turnkeylinux.org) so I can process your refund for you. Thanks. Thanks very much for reporting. Another user has come across a similar issue relatively recently, but I was unable to reproduce it and unfortunately don't recall exactly what the workaround was. 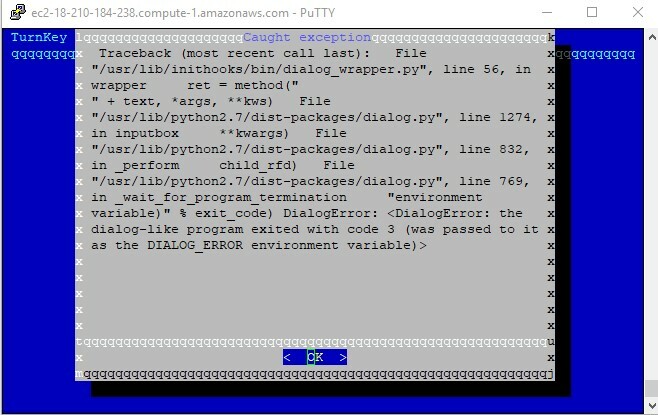 Although I'm fairly certain it was an encoding issue between the server and PuTTY and I suspect that this is the same issue you are experiencing. Looking at your screenshot, it certainly seems to match that. Unfortunately, that has been a somewhat ongoing issue for Windows users which there isn't a consistent/easy fix that we can pre-apply (that won't break things for other users on other platforms). It is somewhat dependant on how Windows is configured and what character set it is expecting. FWIW there are a list of possible tweaks that can be tried on this StackExchange Q&A. That thread explicitly relates to "Midnight Commander" (aka "mc"), but many of the suggestions should relate generally to PuTTY. First up, I would suggest setting UTF-8 as the remote character set in PuTTY - as per the last part of this answer. It may also be necessary to set 'Terminal-type string' as noted in this answer. [update] It turns out that the character set you need to set is "DEC-MCS" (not UTF-8) as detailed in my post below. It just so happens that I have a Windows 10 laptop handy at the moment (I normally don't use Windows) so will test it out on that and see if I can clarify the issue a bit better. It would be really helpful if you could please confirm the Windows locale that you are using (i.e. locations settings IIRC) and I'll have a look and check to see if I can reproduce this and confirm a workaround. I will post back ASAP, but if you have any further info to share such as your Windows locale and/or if either/both of those PuTTY setting tweaks work, I'd love to hear. And actually, it appears to be a bit more involved than I first thought. I have worked out how to fix the weird line drawing and garbled output. To make it display cleanly with PuTTY, it is required to set the "Translation" to "DEC-MCS". I.e. within PuTTY; select "Window" >> "Translation" >> "Remote character set" >> "DEC-MCS" (from the dropdown options). Substituting "MyPa$$w0rd", for your own password, "myemail@example.com" for your real email address and "www.my-real-domain.com" for your real domain. Please also note the single quotes around the password. This reduces the chances of some special characters (such as $) being misinterpreted. Although be aware that some special characters will still be problematic, such as single quotes and the Windows slash (aka backslash, i.e. '\'). If in doubt, select a password that only contains upper case, lower case and numbers, then update it within Magento itself. Anyway, I'll have to dig in a little deeper. I'll post back once I have a better fix. Once I have devised a proper fix, I plan to also update the Magento appliance so it includes the fix OOTB. Ah ha! I've worked out the cause of the issue! And have a fix. It turns out that the cause of this issue is because the default PuTTY screen size is too small to display all the text of the next screen that should show! I could actually reproduce it from within my Linux SSH client too by reducing the size of the window. The simple workaround is to increase the size of the putty window (click on the bottom right corner and drag the screen larger) as soon as you start. Or alternatively, you can explicitly set it to something like 80 x 43 (default it 80 x 24) via the PuTTY "Window" config option (i.e. columns: 80 & rows: 43). I have fixed the appliance code, plus made a couple of other minor improvements (see what I've done here if you're interested). An updated appliance is currently building. Unfortunately it won't be available via the AWS Marketplace for a week or 2 (by the time our publishing process is complete and AWS update the listing), but I'm pretty pleased that I've worked out the issue and have a fix.